I like to buy things for people. It’s fun for me, and I like to see them enjoy something I’ve gotten for them. It carries over to my cats, but it doesn’t carry over very well. See, cats don’t care. You can get them the coolest cat thing ever, and you’ll never once get a “thank you” out of them. The best you can hope for is that they don’t deposit a hairball in your direct path. 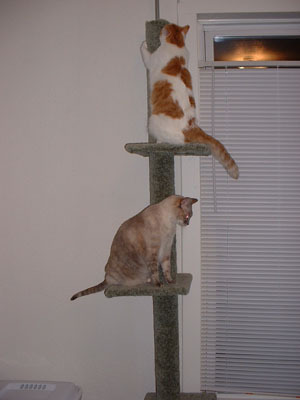 Today I got them a two-story, um, thing. I don’t know what to call it – I guess the tag calls it a “kitty condo,” but that’s just too ridiculous. It’s pretty much a two-story round thing, about two feet tall. They can’t really fit inside the compartments in this thing, but they like to sit on top of it and sleep or look out the window. They took to it pretty well, after a lot of sniffing, so I guess that’s good. What was not good was me walking through the store with this thing while I’m getting some groceries. I doubt I could’ve looked like a bigger idiot. The cashier was nice enough not to call me names to my face, but I’m pretty sure I saw her write some down to share with her cashier buddies later. So when it comes right down to it, I guess I’m not really buying the toys and towers for the cats. I’m buying them for me, in the hopes that the cats will do stuff on and to them that will amuse me. Next thing I need to buy “for” them is a video camera so I can force the world to be amused by my cats doing the exact same things that cats all over the country do.